Toddler recipes: 3 ingredient, quick and easy recipes for kid food. Includes 3 ingredient banana pancakes, easy salmon sticks, a quinoa blend for stirring into almost anything, and a easy vegetable snack! 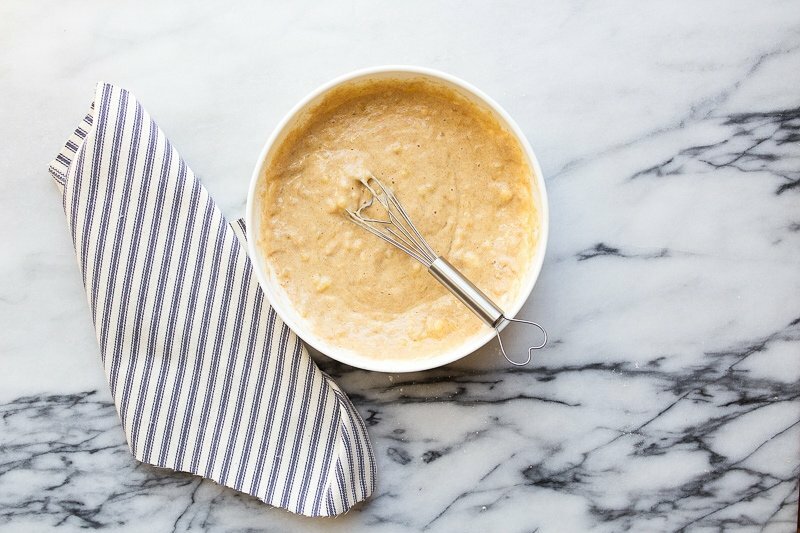 See my Baby Food section for more toddler recipes! Camille is coming up on 22 months old, and I’ve really enjoyed feeding her. I knew before she was born that eating healthy food was going to be a priority for me as a Mom. I’m one of those people that doesn’t feel good unless I eat well, and I can only imagine someone that shares my genes might be the same way. I’m going to get controversial on you, right off the bat. I hate ‘kid food.’ I do not buy food marketed towards children. Every time I’m at Target and I see another piece of junk food with a ‘Finding Dory’ character printed on the front, I curse under my breath (and then steer my cart to the wine aisle). It can be hard to feed your kid real food. When in doubt, think back to your grandma’s time…what did they give their kids for snacks? (Steamed green beans + hard boiled eggs, cottage cheese + homemade applesauce, cheese cubes + fruit, peanut butter on homemade bread with a glass of milk—in case you needed help on that one). Grandmas are an incredible resource as you raise babies, and not just for snack ideas. I describe ‘kid food’ as everything they sell to Moms from the moment babies turn 3-4 months old. My personal object of deep hatred is baby puffs. What in the heck are those? Empty calories? I can think of dozens of better real food options to give your kid than a puff of air with vague grain components sprinkled with vitamin dust (the vitamins that were removed during the grain discombobulation, no doubt). During ‘puff time’ I gave Camille quartered blueberries and steamed carrot pieces instead. If you love baby puffs because they’re shelf-stable, can I recommend freeze-dried fruit instead? It’s literally one ingredient (fruit!). When Camille was little, I always kept freeze-dried strawberries, a banana, an avocado, and Ezekiel bread cubes in my diaper bag). Side note: don’t get me started on baby yogurt. Camille has only ever had plain, whole milk yogurt. As she’s gotten older, I’ve added fruit on occasion, but if you never buy them sugar-drench yogurt, they never develop a taste for it. And then you don’t have to pay $5 for 6 thimbles of sugar/ yogurt with Dory printed on label while I pay the same amount for a 32-ounce tub of plain yogurt. Don’t you even talk about “fish crackers” around me. I’m serious. DON’T DO IT. I’m an intense Mama, clearly. I know my approach to feeding Camille is extreme. You don’t have to be as extreme as me. In fact, you probably shouldn’t. You should probably relax and let your kid have a freakin’ donut every now and then. (For the record, Camille has had exactly 1/4 of a donut in her life, but I gave her milk and strawberries beforehand to minimize the amount she would eat). While I love these toddler recipes, I don’t recommend obsessing over everything that your kid eats like I do. My husband rolls his eyes at me, and I know he thinks I’m being annoying. A few months ago, he took Camille to visit his family for a weekend while I stayed home, and I’m still worried that he let her eat horrible things. I didn’t ask, and he didn’t tell. I’m just praying fast food wasn’t involved. It’s not good to be as overly concerned as I am. But we can meet in the middle with easy, 3-ingredient REAL FOOD toddler recipes! I’ve got an easy 3-ingredient recipe for every time of the day, plus variations, too. If you have ideas to add, please leave me comments below! I’m always looking for new ideas! 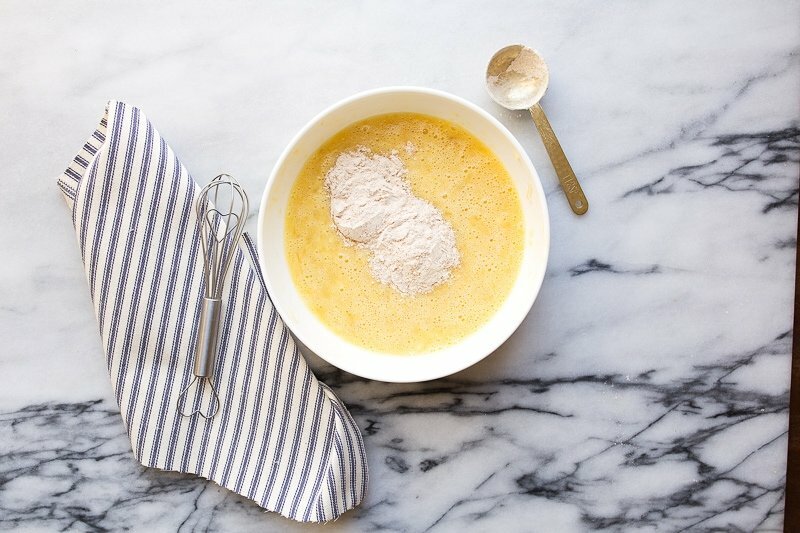 I want to hear your easy toddler recipes, too! While I make breakfast, Camille sips on whole milk or homemade almond milk (which I make as a treat for myself, but somehow the baby ends up drinking the majority of it). 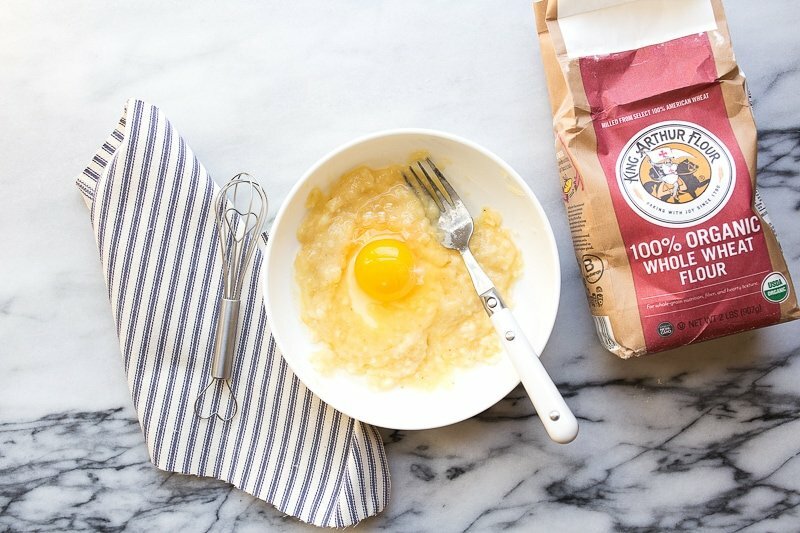 These 3-ingredient pancakes are her favorite. Even when she’s had a big dinner with dessert the night before, she will still scarf down one of these pancakes. My large banana measured 1/3 cup smashed, my eggs are size large, and my flour is whole wheat. I’ve also used oat flour (grind up rolled oats in the blender), and I’ve also added cinnamon and vanilla. Tiny diced walnuts would be good here, too, and it would up the banana bread flavor quotient. Next time, I’m going to add tiny frozen blueberries! 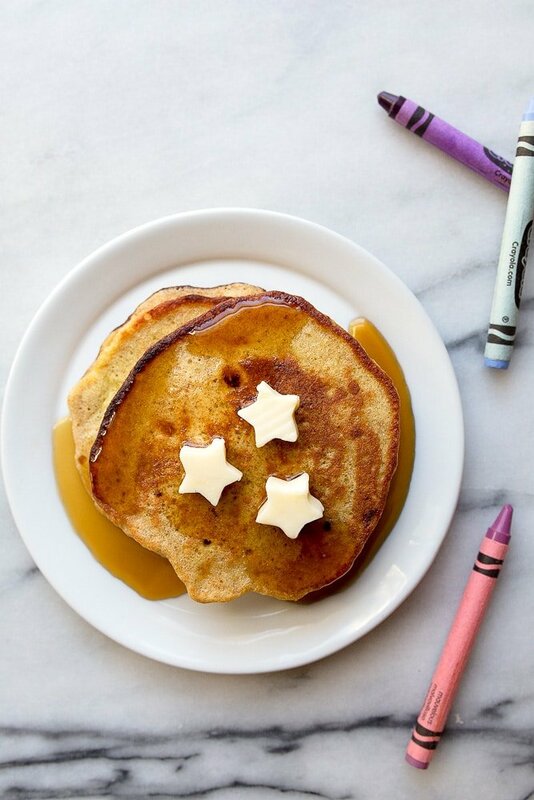 This recipe makes 4 kid-sized pancakes. Camille eats one and I freeze the rest, but feel free to scale up the recipe as needed and pack your freezer! Cook them like regular pancakes on a buttered griddle. Serve with more butter and maple syrup. Four days a week, Camille goes to daycare for 3 hours each day. While she’s there, she eats lunch with the other kids and socializes. (This is when I get most of my work done, especially photography, as tripods and children do not mix). I’ve been making these salmon fish sticks a lot lately, and she loves them! 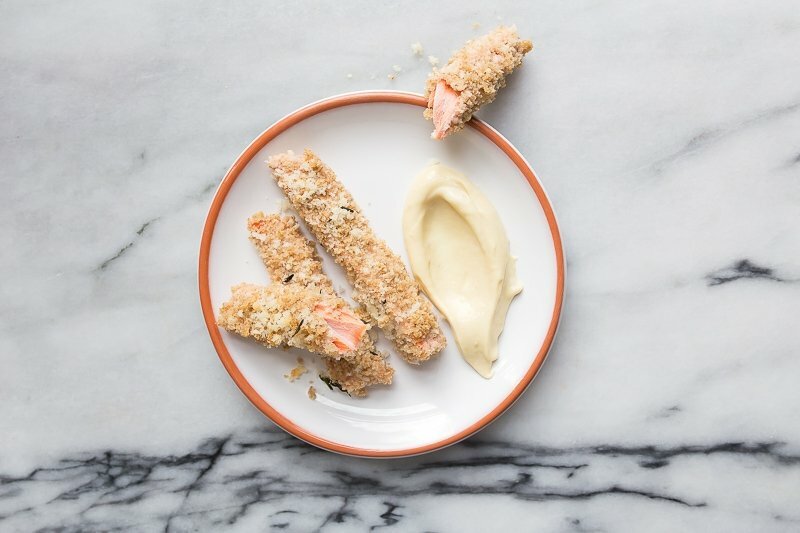 After dipping each salmon strip in egg and then panko, place on a greased baking sheet, bake at 400 for 9-12 minutes (cut into one to ensure they’re done). When I’m feeling fancy, I do half breadcrumbs, half Parmesan cheese. And the day I took these photos, I had some extra fresh thyme, so I stirred that in, too. Camille is in a serious dunking phase (she says ‘dip dip dip’ while she dunks her food into sauces), and so I pack a little container of cheater’s aioli (1/4 cup mayo + 1 teaspoon Dijon mustard + 1/4 teaspoon smoked paprika). Ooh, that was a bonus 3-ingredient recipe for ya! I have weird feelings about snacks for kids. When we go to the playground, I notice other kids eating almost constantly. I wonder if they eat their food at mealtime? Camille’s snacking has always been limited, and therefore she’s always eaten her meals, so I’m not going to mess with it. The one exception is when she wakes up from her afternoon nap. We eat dinner pretty late in our house (after 7pm), so when she wakes between 4:30 and 5:00, she needs a little something to eat. I try to limit her to fruits and vegetables that don’t fill her up too much so that she’s hungry for dinner. Camille has been convinced that tomatoes are grapes. I blame this on last summer’s incredible tomato crop. I took her to the farmer’s market one morning, and her eyes fell upon a display of colorful cherry tomatoes in blue cartons. She demanded them (and who am I to get in the way of a child demanding vegetables?) I bought 3 cartons, and they were gone in a few days. She’s been very into tomatoes ever since. When my avocados aren’t ripe, I use black beans (I cook several pounds of black beans at a time and freeze them; if I pull them out in the morning to pack her snack, they defrost perfectly by the afternoon). Sometimes I substitute cucumbers instead of tomatoes. I buy the tiny Persian cucumbers, and Camille eats them like apples. I was in camp ‘kids eat what adults eat’ before I even had kids. If you know how busy I am, you know that cooking a separate dinner for a kid was never an option for me. I try to keep Camille in mind when planning our meals and include something she loves at every meal. I’m also a firm believer in continuing to serve something even if a kid says they don’t like it. Camille is a bit too young for the ‘take two bites/ try everything on your plate’ rule, but when she’s a bit older, I will be employing that strategy. She’s also too young for bribery (trust me, I’ve tried). But it’s okay, because there’s really only one thing she refuses to eat: red meat. I’m definitely concerned about lack of iron in her diet, so I give her plenty of black beans, raisins, and spinach in her smoothies). Our favorite source of iron is lentils. Speaking of lentils, my amazing blog friend Kelly (who has a child that eats very well!) 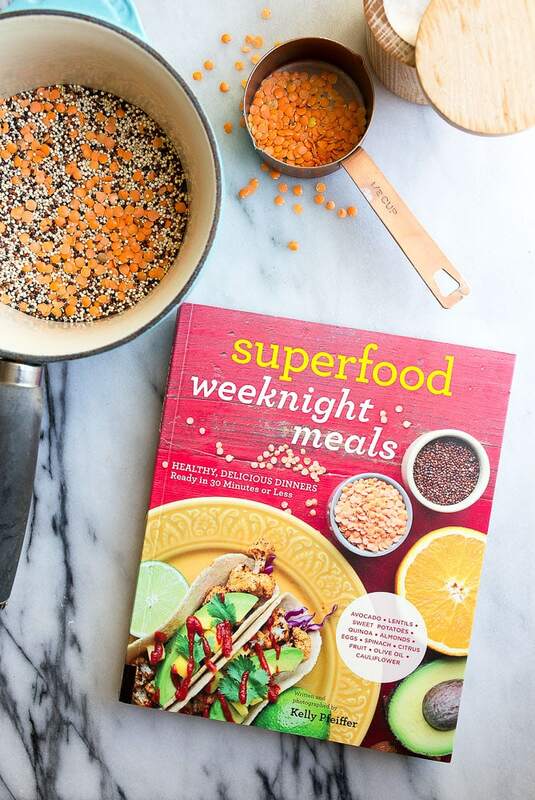 wrote another cookbook, Superfood Weeknight Meals: Healthy, Delicious Dinners Ready in 30 Minutes or Less, and I was so eager to get my hands on it! I absolutely loved her first book, and this is another extension of Kelly’s brilliant mind when it comes to nutrition. The premise of the book is incorporating 10 superfoods into your diet in exciting new ways: avocados, lentils, sweet potatoes, quinoa, almonds, eggs, spinach, citrus, olive oil, and cauliflower. All of her recipes are ready in 30 minutes or less, too! I mean, really, Kelly couldn’t make it easier for us to eat healthier (and deliciously!). I’ve made at least a dozen things from the book, and loved it all (especially the broccoli cheddar soup, buffalo-ranch lentil burgers, and the green goddess quesadillas), but my favorite thing about this book is her genius strategy for cooking a pot quinoa-lentil blend and incorporating it into meals throughout the week. She stirs it into burgers, wraps, soups, smoothies, even fruit cobbler! If you have a bowl of quinoa-lentil blend in your fridge ready to go, you’ll find all kinds of ways to use it throughout the week! If we make it to the end of the week with just a mere 1/2 cup portion leftover, I always make one of Kelly’s grain bowls with coconut-almond sauce (exactly as delicious as it sounds!). To make it, combine the quinoa, lentils and chicken broth (you can also sub water, especially if you think you’ll be using it in sweet recipes). Stir everything together, bring to a boil and then reduce heat to medium. Partially cover the pan and steam for 20 minutes. Refrigerate leftovers for up to 1 week. So, grab Kelly’s book, and these 3 ingredients to make a pot of goodness you’ll use all week! And leave me comments and tips below on how to get kids to eat healthier, more adventurous meals. I love learning from other Moms. Love this! I tried the pancakes this morning and they were delish! 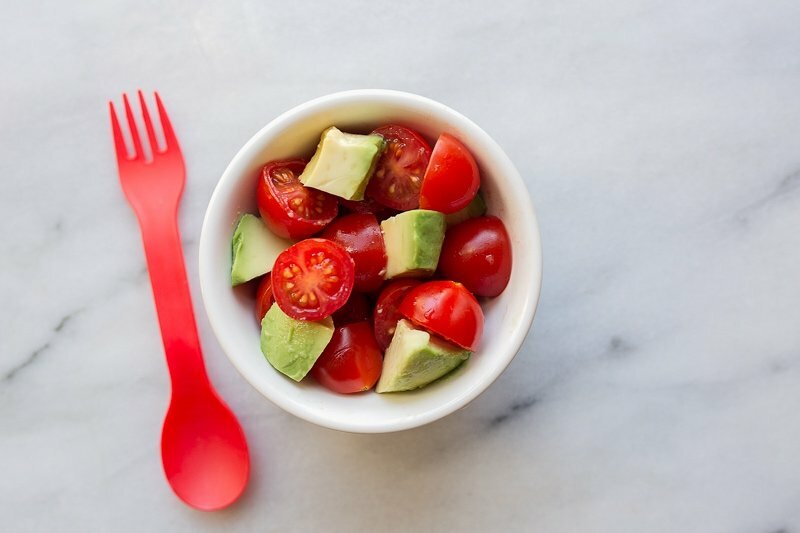 Thank you for sharing such yummy healthy baby and toddler recipes. I’m lucky that my little guy is right around Camille’s age so you share all these recipes at perfect times for us! Keep up the great work as always Christina. I love this post! I am not a mom (yet!) but I hope my future kid eats as well as yours. I really admire your parenting-style – way to do what works for you! I love this post! I’m not a mom yet, but I imagine I’ll be somewhat like you when it comes to feeding my kids :) My sister is maybe not quiteeee as extreme, but she makes almost everything she feeds her 2.5 year old boys and they are awesome eaters!! Her biggest problem is trying to convince them to put down their huge heads of broccoli so they can get some protein. Love love love this post. I think we might be baby/toddler food twins. I have been fearing daycare food for these exact reasons. I will definitely be making the banana pancakes! I actually made some homemade cheese crackers (too lazy to cut them into goldfish shapes) and they were a hit, whole wheat flour and lots of good quality cheddar. I would love love to hear how you handle and pack your little one’s snacks and lunches. My son just turned a year old and I’m always on the lookout for new lunch ideas. This post speaks to me! Though currently childless, I object to feeding my children a separate meal from my own. My only concern is, what about when I eat food with hot peppers or things that are roasted in the oven until they have a crispy burnt-ish-tasting edge? I imagine a child would be horrified by the taste, but as an adult I don’t really want to lose any of the delicious flavor in my foods. Any thoughts? What was your technique? Or are most of your meals just not particularly spicy/strong? So Camille is insane and loves spicy foods. To be fair, I’ve been letting her dip her fingers in my salsa since she was about 8 months old. I know, I’m a Texan. I’ve seen Mexican babies eat salsa, too. When I want to make super spicy Thai food for me and my husband, I try to do it on a night when we have other leftovers for Camille to eat. She’s still going to reach for what we’re eating, but after one bite, she’ll go back to her non-spicy food (or ask for more of ours, haha!). I loved reading this post. I am a former kindergarten/early child hood educator and I was constantly appalled at some of the food choices parents made for their young children. I could see so many food related illnesses in the future for so many children I taught.I am totally opposed to selling food targeted to kids via popular media/film/cartoon characters. Kids just need to eat good, nutritional, regular food…not special ” children’s food”. I do think it is okay to expose young children to very limited amounts of sugar…teaching them via example about reasonable, responsible sugar intake in a diet. All that said, I have ll thee ingredients for those banana pancakes and will be making them for myself tomorrow morning! 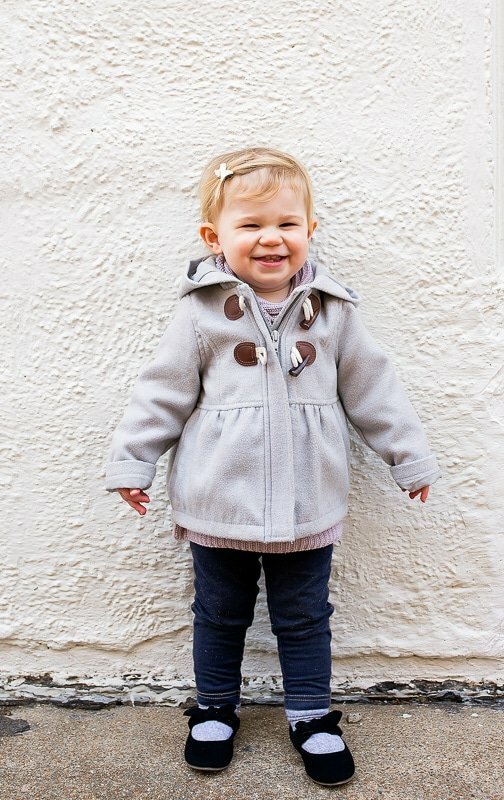 Oops,I forgot to say that Camille is such a cutie…that smile must melt your heart every day. It’s such a big responsibility, isn’t it? I feel like every morsel of food is a step in her health. We joke that Camille is going to live to be 150+ years old. I don’t have kids (yet!) but I see myself being super particular with food too. Whenever I go grocery shopping I pass right over the commercial pantry items (ie crackers, cereal, packaged snack goodies)…so why wouldn’t I do this when feeding someone else? Stay strong! Ignore the Finding Dory gummy snacks! Everything in moderation. Or at least the bad things. Camille is still young, and you have total control- so starting her on a diet like this is a great way to form her palate. But as she gets older and gets invited to play dates and especially kids parties where pizza, popcorn, chips, cake are all served with abandon, don’t be surprised if her palate and desires change. Saltine goldfish are not the end of the world (I still love a few of them in my own soup!) it’s a wonderful thing to raise a future foodie… but it’s another to stress healthful so much that your child begins sneaking food behind your back to try what her friends are trying. Here’s what I’m saying… good job for now… know when to pull back later. Yeah, I definitely hear ya. It will be interesting as she ages. I feel like I can be 100% in control right now, so I will continue to be, but as she ages, I know I’ll have to let her go. I was NEVER allowed sugar as a child, and look at my career choice! I’m a total sugar addict! I do let Camille eat small bites of real desserts made with real sugar on occasion. But processed food is something I won’t budge on. She can have it at friend’s houses and at school when she gets the rare chance, but I will not be buying it. This is inspiring! We have been giving our almost one year old only real food since she started solids and I so appreciate reading your thoughts and feeling on the subject. These are great recipes and I look forward to trying them all with my sweet baby B. I’m planning on making her your refined sugar free cupcakes for her first birthday next week. Thank you, and I hope to see more of this! Along with all the desserts of course. I love your baby food posts. I secretly cross my fingers for more posts like this. I have an 11 month old daughter. When she started eating solids, it really gave me an eye opener to what my husband and I eat. If I won’t feed it to the baby, we don’t eat it now either. (Except occasional fry and Diet Coke runs but I’m not here for judgement. Just be glad I told you at all). I struggle with breakfast. We do eggs with veggies, PB toast with bananas…she really doesn’t like Oatmeal. I’m thinking of trying quinoa next. What were your tried and try favorites around a year old? Thanks for such a great blog! You have lentils listed twice in the last recipe. I assume one should be quinoa, but which measurement? I’m anxious to try it. Thanks. …but which measurement is quinoa? 2 cups? Sorry, I fixed it. Quinoa 2 cups, lentils 3/4 cup. Kid yogurt is the worst. I keep plain yogurt on hand at all times. My son loves it mixed with homemade applesauce and pumpkin purée with a dash of pumpkin pie spice. It’s like pumpkin cheesecake! Oh yes, I’m scrambling to come up with fish recipes for Lent right now! I think we’re going to our church’s fish fry this Friday, and I’m curious how Camille is going to handle REAL fried fish after she’s had my faux-friend version, hah! I love this, Christina!! I thoroughly believe in the girls eating what my husband and I eat, not “kids food.” We are big fans of chickpeas, from making hummus that we dip our veggies in to roasted chickpeas with nutritional yeast and spices. I always had those in my diaper bag when they were younger. Mine tend to snack on fruits of all varieties which I’m happy about but I do make them your graham crackers, as you know, along with other homemade snacks – including wheat thins, cheese crackers (which I’ll often change up by replacing the cheese with nutritional yeast) and fig newtons which are my favorite as they are vegan and refined sugar free. You’re like my baby food mentor! I’m pinning this for future reference and can only hope I end up with little ones as amazing as Camille! Thanks for the pancake recipe! My 9 month old enjoyed it which I was semi-surprised since I’ve exhausted her on bananas :) Any tips on getting her to eat veggies? She doesn’t have any teeth yet, but she manages to eat foods she likes with no issue. Put a piece of broccoli or carrot on her tray and she picks it up and puts it in her mouth only to spit it back out. I keep trying but she’s not enjoying them any more than she did at first, though she eats them pureed just fine. Help!! You go girl! Those are some awesome healthy kid recipes. I feel the same way you do but have caved big time out of exhaustion. I’ll have to try scale up some of your recipes to feed my army! Kudos to you for feeding your daughter so well! I have never met anyone who who fed their child as well as I fed my son when he was little & while we haven’t met, I still say kudos! My son didn’t have his first sweet treat (crap so-called “food) until he was 4 years old & his dad’s mother fed him some apple fritter & Dr. Pepper. My son came home with a mysterious rash. 3 days later grandma fessed up & I was livid. In 3rd grade, he got his 1st taste of soda because I had a dentist appointment that wouldn’t reschedule. I wasn’t there to supervise & he threw the soda up. Way to go teacher for allowing 3rd grades Mtn. Dew. Needless to say, he will be 18 this month & doesn’t drink soda or eat sweets very often. When he does, like me, he regrets the decision because he gets sick. Raise them with whole foods now & save their little lives later. Everything we instill in them now makes a lasting impression. No kids and not expecting to have any (I’m 70 years young!) but these recipes appeal to ME! Sound great and not huge amounts … just a kid at heart, I guess! Thank you. 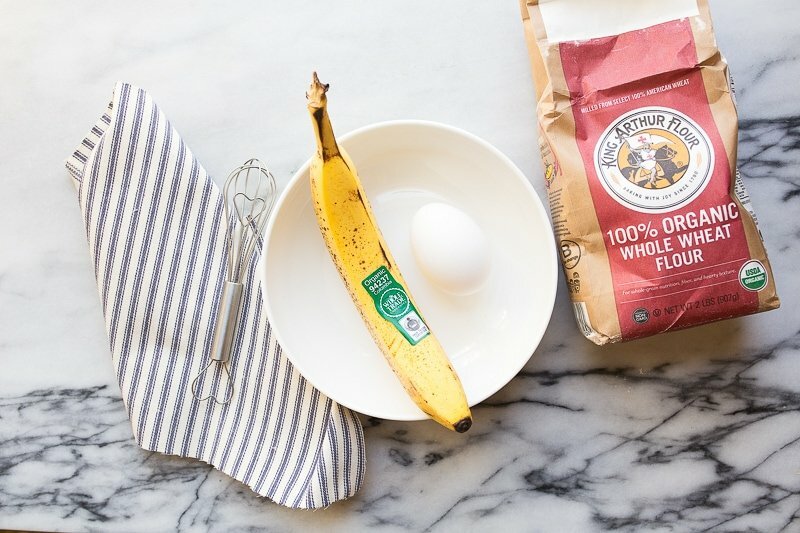 I’ve made the banana and egg pancakes for several years now but instead of flour I use oatmeal or steel cut oats and wow does that ever bump it up a notch. You nailed my 3 top nutrition pet peeves with kids in your opening paragraphs :) Puffs, kids yogurt, and goldfish crackers. Some may call it extreme… i call it awesome! Keep up the amazing work and spreading the word! I bought all three books and I just Love them. I’ve had a really hard time trying to learn how to cook for two. I’m so used to cooking for four. When will you come out with a book for lunches, and dinners? I just can’t read things like this and not say anything. I’ve been working as a therapist for children with eating disorders for 6 years and I have seen MANY MANY children (as young as 8) required to undergo inpatient treatment because they are so afraid of “unhealthy” “processed” “junk” foods. I say this with a vast knowledge of nutrition and mental health. I’m not saying this will happen, not at all, but please know when it’s time to loosen the reins. I’m not so afraid of kids growing up and going crazy with sugar as I am of kids becoming so scared of food that they genuinely fear for their health if they have a goldfish cracker. And I’m not knocking healthy eating, I have a toddler too and I make the majority of her food. But you better believe I let her eat goldfish crackers and don’t bat an eye. I don’t want to sound preachy. I know you’re doing a great job and a lot of what you said is commendable, I have a really hard time with this subject though. I agree with others – everything in moderation. I want to share my story. Not because I want any sympathy (me) or because I want to bring up weird feelings (you) but I just wanted to share from a different perspective. My grandmother ran a cooking school. She was on a first name basis with Alice Waters and Julia Child before she passed away. Cooking is in my blood. I love food. I love good food, and I know how to make it. Like Camille, my daughter has never had food from a kid’s menu. She’s never had sweetened yogurt (at least under my roof). I either mash up some berries or, on a rare occasion, take a teeeeeny bit of jam and mix it in. She doesn’t eat sweets. I, however, have a chronic, progressive illness. I’m physically not able to make all of the food that I’d like, and my recipes get more simple as time goes on instead of more complicated. It’s kind of a crappy feeling for being 32. I have a daughter a few months younger than Camille, and my cooking has been pretty spotty, as well as my health. I have bought goldfish crackers. I buy Annie’s macaroni and cheese. At my worst, I went a few months buying shredded cheese (I die a little inside every time I admit this) because I did not have the energy to shred the cheese and clean the grater afterward. I have slowly been letting go of the mom-guilt I feel of literally not having the energy to make all of these wonderful things that I want to. I’m just now, nearly 18 months after she was born, just now feeling like I can experiment more instead of relying on my old stand bys. Basically, what I’m saying is this. I know that good quality, whole foods are important to you. They are to me, too. However, life is short. I know I have a different perspective than most, but I have really had to think about what I really want out of my life. I love this age so much (don’t you?) and I ordered a learning tower so that my daughter can work with me in the kitchen. Part of enjoying life is relaxing a little bit. If we go to the movies (a few years away, I’m sure), maybe we will get a small movie popcorn or an icee just for the experience. Or, if we go to a baseball game, we can share a hot dog. Sure, neither are of great quality, food wise, but part of life is the experiences we share together. Anyway, I love your book, your blog, and your instagram. I appreciate everything you do! Your naturally sweetened rice krispie treats are cooling as I type this. I made some slight changes to your recipe to fit these in for everyday stuff (I’m trying to get off of my Ella’s Kitchen Nibbly Fingers habit, even if they are good quality and have few ingredients). I hope your health improves, and that you’re feeling better soon. You’re prioritizing spending quality time with your daughter, and that is AMAZING and 100% the most important thing. And I just bought my first box of Annie’s mac and cheese (and a bag of frozen broccoli, heh!) to add to it for last-minute dinners. And I made a big batch of chicken ‘nuggets’ without the breading (literally, just diced chicken that I seared in a skillet) to keep on-hand all week. I’ve had a lot of issues with time management lately, and my poor marriage can attest, I’ve got to make some changes in the way I run my waking hours. I might need to spend a few hours on the weekends prepping meals so that I can relax and have more time with my family. It’s the most important thing, right? Love to you, Mama! I’m a little late to the party, but I just wanted to say a big AMEN to this post and thank you for sharing! I have a 20 month old daughter and she pretty much eats everything we eat! (Except the desserts we sneak after she’s asleep hehe). Sometimes I make something that comes out a little spicy or try a weird new veggie but she usually surprises me and gobbles it up! I grew up eating tons of junk food (store bought donuts and cinnamon rolls for breakfast, boxed Mac n cheese and hot dogs for dinner) because I honestly think my parents didn’t know any better, but my husband and I have made a conscious effort to eat healthy, whole foods and avoid processed junk and it feels so much better! Also, I totally make those banana pancakes all the time but I use 1/4 cup of quick oats instead of flour and my little one loves them! This is so great to hear, Marianne! :) Thanks for writing! I love your recipes! Thanks for sharing. But I have to agree with some of the others when they say, everything in moderation. And I’m sorry, but there is no way my toddler is going to patiently sip on his drink while I make dinner. Too impatient! And hungry! I often end up giving him a few cheerios to munch on, and don’t see anything wrong with it. He still eats his dinner. I try to make as much of his food as I can, keeping the salt and sugar as low as possible. But I don’t fret about the occasional processed treat. This mom stuff is hard work! You’re totally speaking my language! As i was reading this I was like “omg she gets me…omg she is me” lol. My daughter just turned 1 yesterday so the toddler food posts are very much needed in my life right now. So thank you for this post! Do you separate them and freeze individually? My problem was my stack of pancakes and wax paper all froze together into one big lump; I’ve had to chip pieces off because I couldn’t separate them. Ideas?